Looking For A Mobile Disco In Croydon? Mobile discos in Croydon from JMF Disco will provide you with a good experienced Mobile DJ hire - get a quote for a great party here. JMF Disco will provide the perfect solution for your party entertainment, with a reliable, experienced, professional DJ hire service, providing all the help you need with planning the ‘formalities’ and providing you and your guests with a great party which will be the perfect ending to your special day using our Mobile Disco Croydon service. As part of the package I will provide you with my special party planner pack to help set out how you want the evening to run, timing of speeches and cake cutting, opening of buffet etc, you can list out all your favourite songs you want playing etc so that we all come prepared for what you want to happen and when, playing great music, with all your favourite songs that you and your guests will dance the night away to. Good parties do not just happen they are created and managed - together we can ensure yours is not just another average McDisco party. JMF Disco's Croydon DJ service will provide you with the entertainment you want for your dream celebration at any venue in Croydon and the surrounding areas - why settle for anything less? A house-warming party is a party traditionally held soon after moving into a new residence. It is an occasion for the hosts to present their new home to their friends, post-moving, and for friends to give gifts to furnish the new home. House-warming parties are generally informal. 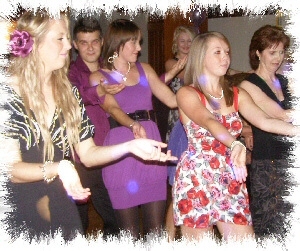 JMF Disco can help add to the party atmoshere and keep your guests entertained. Doing it right requires an experienced DJ with the right skills and resources that we will bring to your celebration by using our Mobile Disco Croydon service. Contact John on Tel 01795 429777, Mobile 07895 546183 or by email to discuss your Mobile Disco Croydon service needs or questions. We also provide great mobile discos at some of the best local venues in the surrounding areas and villages including Addington, Addiscombe, Ashburton, Broad Green, Coombe, Coulsdon, Crystal Palace, Duppas Hill, Forestdale, Hamsey Green, Kenley, Monks Orchard, New Addington, Norbury, Norwood, Norwood New Town, Old Coulsdon, Pollards Hill, Purley, Purley Oaks, Riddlesdown, Roundshaw, Sanderstead, Selhurst, Selsdon, Shirley, South Croydon, South Norwood, Thornton Heath, Upper Norwood, Waddon, Woodside and throughout the London Brough of Croydon. - I'm sure I can provide you with the mobile disco in Croydon you really want!